While not suggesting their situation is comparable to those who’ve lost their homes or families, Electric Imp CEO [Hugo Fiennes] has recently made a post on their blog calling attention to the air quality issues they’re seeing at their offices in Los Altos. 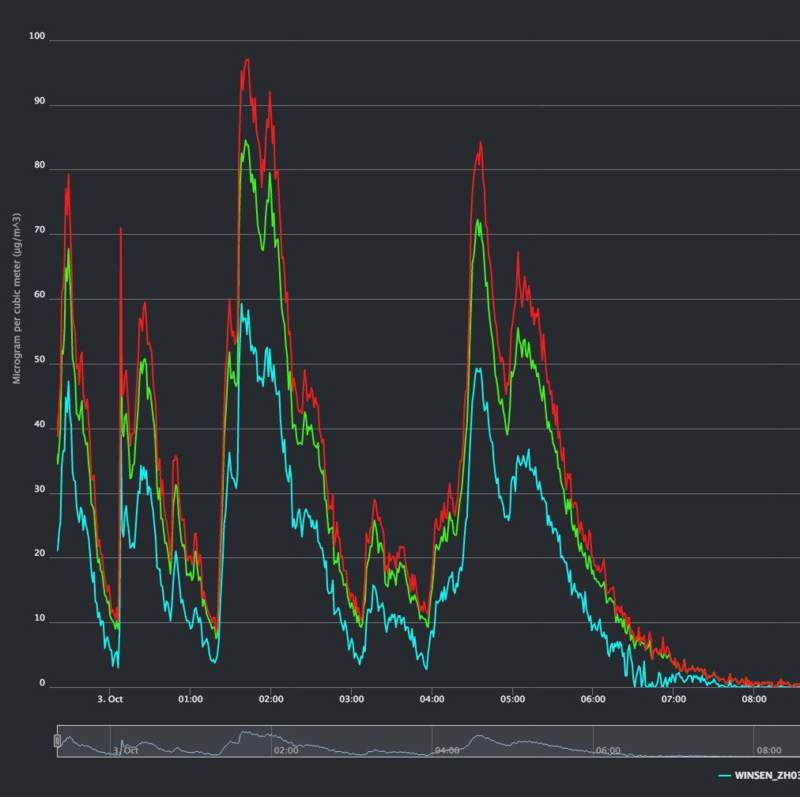 To quantify the problem so that employees with respiratory issues would know the conditions before they came into work, they quickly hacked together a method for displaying particulate counts in their Slack server. The key to the system is one of the laser particle sensors that we’re starting to see more of thanks to a fairly recent price drop on the technology. A small fan pulls air to be tested into the device, where a very sensitive optical sensor detects the light reflected by particles as they pass through the laser beam. The device reports not only how many particles are passing through it, but how large they are. The version of the sensor [Hugo] links to in his blog post includes an adapter board to make it easier to connect to your favorite microcontroller, but we’ve previously seen DIY builds which accomplish the same goal. [Hugo] then goes on to provide firmware for the Electric Imp board that reads the current particulate counts from the sensor and creates a simple web page that can be viewed from anywhere in the world to see real-time conditions at the office. From there, this data can be plugged into a Slack webhook which will provide an instantaneous air quality reading anytime a user types “air” into the channel. We’ve covered a number of air quality sensors over the years, and it doesn’t look like they’re going to become any less prevalent as time goes on. If anything, we’re seeing a trend towards networks of distributed pollution sensors so that citizens can collect their own data on their air they’re breathing. [Dave Thompson] picked up a ZH03B recently and wanted to get it working with his favorite sensor platform, Mycodo. With a sprinkling of hardware and software, he was able to get these cheap laser particle sensors working on his Raspberry Pi, and his work was ultimately incorporated upstream into Mycodo. Truly living the open source dream. The ZH03B has PWM and UART output modes, but [Dave] focused his attention on UART. With the addition of a CP2102 USB-UART adapter, he was able to connect it to his Pi and Mac, but still needed to figure out what it was saying. He eventually came up with some Python code that lets you use the sensor both as part of a larger network or service like Mycodo and as a stand-alone device. His basic Python script (currently only tested on Linux and OS X), loops continuously and gives a running output of the PM1, PM2.5, and PM10 measurements. These correspond to particles with a diameter of 1, 2.5, and 10 micrometers respectively. If you want to plug the sensor into another service, the Python library is a bit more mature and lets you do things like turn off the ZH03B’s fan to save power. These sensors are getting cheap enough that you can build distributed networks of them, a big breakthrough for crowd-sourced environmental monitoring; especially with hackers writing open source code to support them. When [James] moved to Lima, Peru, he brought his jogging habit with him. His morning jaunts to the coast involve crossing a few busy streets that are often occupied by old, smoke-belching diesel trucks. [James] noticed that his throat would tickle a bit when he got back home. A recent study linking air pollution to dementia risk made him wonder how cities could monitor air quality on a street-by-street basis, rather than relying on a few scattered stations. 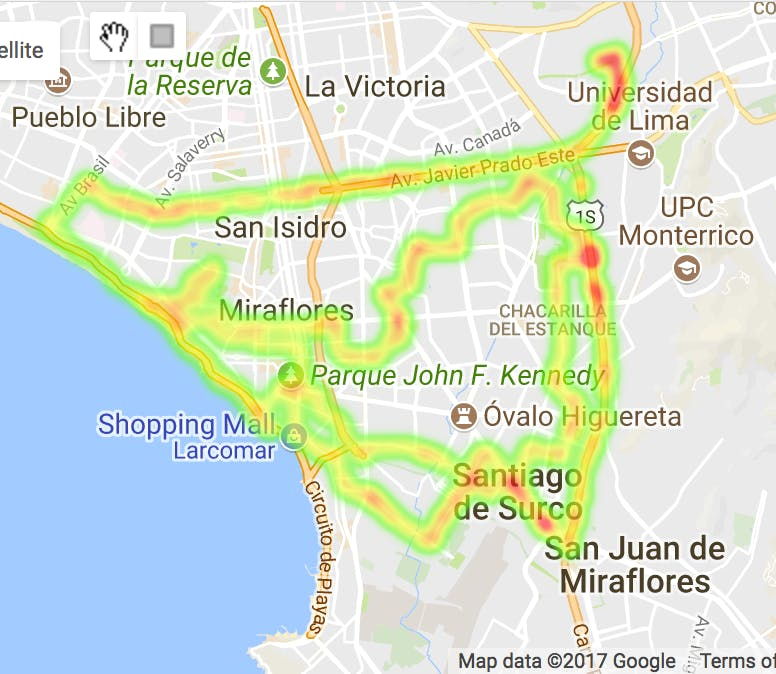 Lima has a lot of taxis, so why wire them up with sensors and monitor the air quality in real-time? This taxi data logger’s chief purpose is collect airborne particulate counts and illustrate the pollution level with a Google Maps overlay. [James] used a light-scattering particle sensor and a Raspi 3 to send the data to the cloud via Android Things. 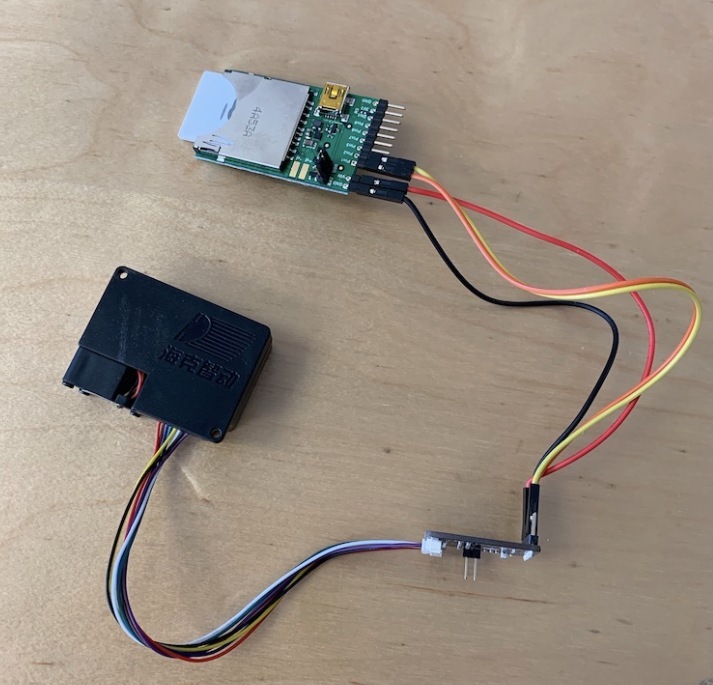 Since the Pi only has one native UART, [James] used it for the particle sensor and connected the data-heavy GPS module through an FTDI serial adapter. There’s also a GPS to locate the cab and a temperature/humidity/pressure sensor to get a fuller environmental picture. Take a ride past the break to go on the walk through, and stick around for the testing video if you want to drive around Lima for a bit. Interested in monitoring your own personal air quality? Here’s a DIY version that uses a dust sensor. Water is kind of like information: both are a vital part of life and are found all around us. But not all water or information is healthy. Much of it may look harmless, but is actually polluted. A staggering number of people in the world have no access to fresh, clean water. ROVs can collect samples and detect pollution, but commercial types are way too expensive for the legions of people who need them. 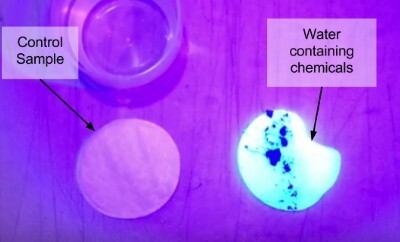 UV light reveals the presence of optical brightening agents in a sample of lake water. [allai5] wants to be the catalyst for change. She’s the president of Rogue Robotics, a group of high school students throughout central New Jersey who have pooled their talents to design and build a simple, open-source ROV that’s affordable, repeatable, and environmentally friendly. The team uses Volturnus ROV to collect water samples and UV light to determine the presence of a general type of pollutant known as optical brightening agents (OBAs). This is the stuff they add to laundry detergents and copy paper to whiten the fibers’ appearance. By design, OBAs fluoresce brightly under UV light. After soaking a cotton pad in water sample, it’s easy to see if OBAs are present. At 12″ x 12″ x 18″, Volturnus ROV is compact enough to explore most of the nooks and crannies of any body of water. It moves under the power of three thrusters—500 GPH bilge pump motors driven by a pair of L298N controllers—and is controlled by an Arduino Mega using a wireless joystick. The driver of the ROV navigates the drink through the eyes of a waterproof car back-up camera whose feed is flipped with a Python script. Volturnus ROV is not a one-stop solution for dealing with marine pollution. The team would like to add filtration in the future and move the electronics to the bottom so it can go faster. Rogue Robotics’ aim has always been to make an ROV that does a few things well. Right now, it’s an excellent jumping-off point for awareness and blueprint for action. Find your inspiration after the break. If you’d like to risk blowing your fingers off for a good cause this week, look no further than [M. Bindhammer]’s search for an eco-friendly rocket fuel. [M. Bindhammer] predicts the increasing use of solid rocket boosters in the future. We’re into that. For now, rocket launches are so few and far between that the pollution doesn’t add up, but when we’re shipping consumer electronics to the moon and back twice a day, we might have a problem. The most common solid rocket fuel emits chlorine gas into the atmosphere when burned. [Bindhammer] is exploring safe ways to manufacture a eutectically balanced and stabilized fuel compromised of sugar or sugar-alcohol, and potassium nitrate. If you watch home chemistry videos for fun on the weekend like us, [Bindhammer] goes through all his thinking, and even spells out the process for duplicating his fuel safely in a lab. He’s done a lot of work. The resulting fuel is stable, can be liquid or solid. It has a high ignition temperature, but as you can see in the video after the break. Once ignited. It goes off like rocket fuel.